I drove up to Le Mars, Iowa on Wednesday to visit the Plymouth County Fair. 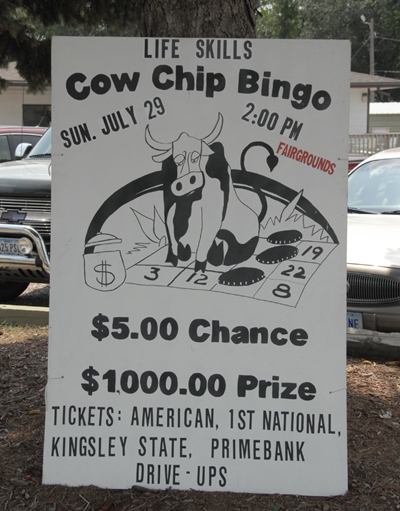 I’ve never, to my recollection, been to a County Fair. After being to a County Fair, I think I’d remember if I had. It was the first day of the Fair and the middle of the day on Wednesday so there were not too many people there. Mostly just the people that had brought animals to be judged, or sold, or, I’m guessing, eaten. There was a barn for each of your standard farm animals: sheep, goats, horses, pigs, chickens and other birds all classified by the sign “Poultry”, and of course beef (cows). I did expect to see llamas and emus but maybe that’s more of an Oregon thing. The chickens though… I have never seen such a variety of chickens in my life. 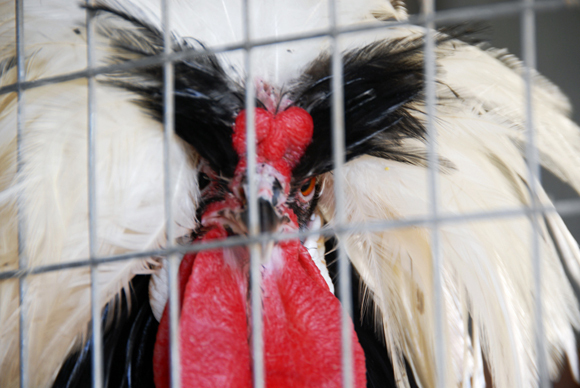 There were some weird chickens, very colorful, stylish, and yes weird, chickens. Also, I’d hoped to find some 500 pound pig that I could hitch a ride on, but no, no such pig ride was available. Now I should visit a State Fair, maybe they’ll have a pig for me to ride. 10 days since my last post. I’ve been keeping pretty busy, busy enough that it now feels like I have a very short time left here in Sioux City, and so much left to do. Earlier this week I headed off to see what RAGBRAI was all about. RAGBRAI stands for: Register’s Annual Great Bike Ride Across Iowa. This year it is a 477 mile ride across Northern Iowa comprised of some 10000+ riders from all over the world. They start by dipping their tires in a river on the Western side of Iowa, ride for 5 days, and then dip their tires in an Eastern river to finish. 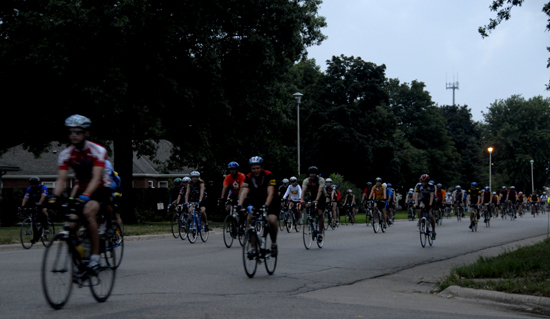 Sunday I arrived in Rock Rapids around 8am and the majority of riders had already set off on that day’s 77 mile leg. I drove back home for a few hours sleep and then set back out to see what the nightlife of a RAGBRAI stop was like. 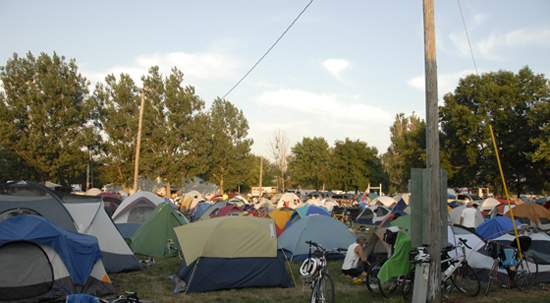 So back on the road to Spencer, I arrived about 7pm and saw fields and fields of tents and more bikes than I’d ever seen in one place. The population of Spencer, IA had literally doubled that day. The evening’s festivities were held at the Fairgrounds – although I doubt there was a single parking lot or side street that wasn’t active – I ended up spending the night drinking and people-watching in the Fairground’s beer garden until it closed at 12:30am. I made my way back to the van in a nearby parking lot and passed out. I awoke about 5:30am to find that everyone else was already up and on the move. I wiped the sleep from my eyes, hopped in the driver’s seat, and headed off for a vantage point to get some pictures. I followed the route of the bikers, which meant I was driving with the tide. Literally it was like a stream of bikers flowing past me. I was the huge obstruction on their street and once I was in the path there was little to be done about getting out of it. I was surrounded on all sides and turning off to a side street just wasn’t an option. I didn’t get out of the mass until the route turned right and I was able to continue straight. I considered following the event to the next city but decided to drive back home instead. I had a lot of fun that night and riding RAGBRAI is now something that is definitely on my list. I will really have to train up though, I’m nowhere near the physical shape I’d need to be to finish the ride, but hey, goals are good. There are an incredible amount of bugs in the Midwest, I’d say half of them are visiting my laptop right now. I’m on the back patio of a bar in Sioux City, alone, with a $5 pitcher of Bud, trying to control my urges to knock the bugs off my person and laptop. It does no good… they come back. At least if I leave them alone, maybe they won’t tell their friends, so they can have that eerie glow all to themselves. I can hear the stray bugs from the nearby safety light bouncing off the Coors umbrella attached to my table. It’s like a sporadic bit of insect rain. The sounds around me are pretty impressive too, there is the machine gun fire of some, the long creaking Morse code of others, and the deafening noise that the Cicadas make. If you’ve never seen a Cicada they are an incredibly ugly bug. I’ll never understand the mentality that goes into a bar fight or sidewalk stabbing. So kids. Guys and Girls. It’s simple, really it is. Be aware of your surroundings and try not to overstep your bounds. Know when an apology is the right thing to do. Respect women or men as the case may be, and know that whatever happened is an opportunity for you to exit. Exit the drama, exit the people who can’t control themselves, exit the ego driven situation where the person offended is so sensitive that they have to hurt someone else. Those aren’t good people, however noble their intentions sound, those are small people, with fragile egos. Those are dangerous people who will find themselves in jail eventually. And I can’t think of a better place for them. But then again, I’ve had my drinks tonight, I’m upset, and I think someone got blood on my van.